The AME5258A is a high efficiency monolithic synchro- nous buck Regulator using a constant frequency, current mode architecture. The device is available in an adjustable version. Supply current with no load is 300mA and drops to <1mA in shutdown. The 2.5V to 5.5V input voltage range makes the AME5258A ideally suited for single Li-Ion bat- tery-powered applications. 100% duty cycle provides low dropout operation, extending battery life in portable sys- tems. PWM pulse skipping mode operation provides very low output ripple voltage for noise sensitive applications. At very light load, the AME5258A will automatically skip pulses in pulse skip mode operation to maintain output regulation. The AME5258A is simple to use. As with standard LDO's,Input and output capacitor are required. The only other element is a small, low cost, 2.2mH inductor.Low output voltages are easily supported with the 0.6V feed- back reference voltage. And 100% duty cycle when Vin approaches Vout. By AME, Inc. 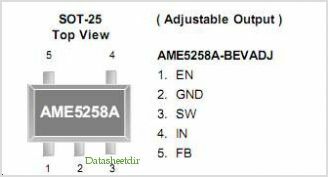 This is one package pinout of AME5258A,If you need more pinouts please download AME5258A's pdf datasheet. 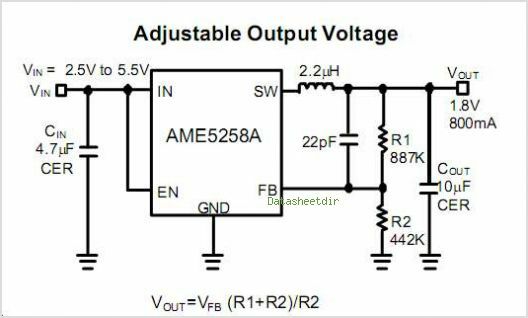 This is one application circuit of AME5258A,If you need more circuits,please download AME5258A's pdf datasheet.